Jaiden Shephard, founder and designer of Vintage Ties by Jaiden LLC, has developed an inspirational event taking place in Metro Detroit. Finding My Way Home will take place on Saturday, February 15, 2014 at the Royal Oak Public Library, 222 East 11 Mile Road, Royal Oak, MI 48067. Advance tickets are on sale now for $12 in advance and $15 at the door. The event is officially a nonprofit event with 501(c)(3) designation. Seating is limited at this event. Finding My Way Home is being hosted by local singer, Labella Passion and features a platform of speakers with ties to fashion & entertainment, who will tell their stories of past struggles and where they are now. “My desire for Finding My Way Home is to reach all people; no matter the race, background, religion, origin, sexuality, or social rank. Everyone has a past, a present and a future. Finding My Way Home will serve as a middle ground for everyone collaborating together for one common goal; to elevate and inspire our communities through our creative works, throughout Metro Detroit and beyond” says Shephard. A donation of canned goods will also be made to Forgotten Harvest and the event features a fashion show. Clayton Zook served in the United States Army and has a daughter who is an aspiring model and basketball player. Rondregus Underwood is the owner of rising talent company Underwood Entertainment Group LLC. Sunny Tookes is an international model and psychologist. John Trimble is a speaker and activist who shares wisdom regarding owning your own power and being true to yourself. Christina Chatine is a talented playwright and screenwriter from Detroit, Michigan. Angela T. Jones is CEO of Super Woman Productions and Publishing, which is a media brand from Detroit, Michigan. 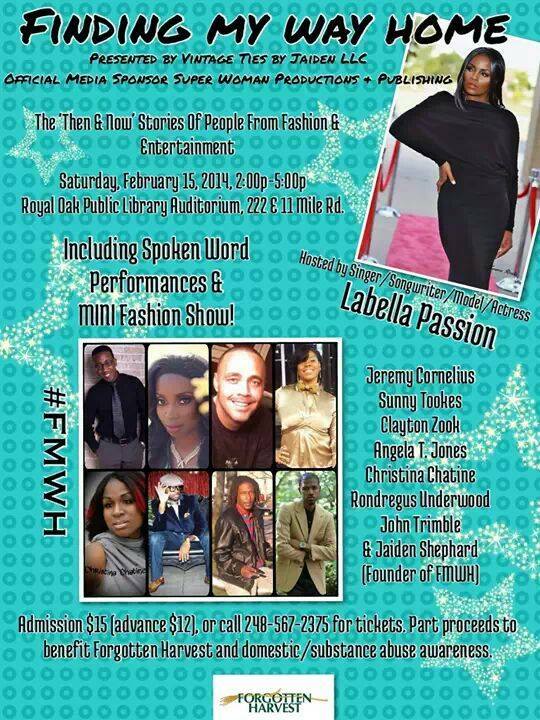 Jaiden Shephard is the designer behind Vintage Ties by Jaiden LLC and the producer of this event. Vintage Ties by Jaiden LLC launched in February 2012 in Detroit, MI. In a little over a year, Vintage Ties by Jaiden significantly grew as a brand and experienced a tremendous amount of exposure, through approximately three dozen fashion show appearances including Michigan Fashion Week, special event features and local magazines. Vintage Ties by Jaiden first appeared on WJBK FOX 2 News ‘Style File’ segment, then went on to be featured numerous media outlets. Brief selections of ‘VTJ’ items (including items featured in runway shows) are available for purchase at Gentlemen’s Consignment in Royal Oak, MI. Finding My Way Home is a philanthropic arm of Vintage Ties by Jaiden LLC; a portion of the money from the event will go to benefit substance abuse and domestic abuse programs. Tickets for the event are available online at Finding My Way Home on Eventbrite.com or you may contact Vintage Ties by Jaiden at http://www.vtjties.com for additional ticket purchase options.